It's time for some real talk... As a lifelong member of the fatty club, one of my biggest bugbears is tiny towels. Something I doubt thin people ever have to think about, but one of my main worries (other than bedbugs and dirty sheets) when staying in hotels is whether the towels will fit round me. My household towels barely do if I'm honest, so when The Towel Shop got in touch I was intrigued to see how theirs would measure up! First off I was sent the XL robe. Sadly it didn't quite fit round my hips, there was a little bit of gapping that could have cause a bit of embarrassment, for reference my hips are 52 inches, so if you're 50 inches or below, it's going to be fine for you. I am however happy to report the XL towels were a success! Welcome to my slightly skanky bathroom and scary makeup free face, BUT I am wearing a towel that not only *just* wraps round me, but wraps round me with room to spare! And it's incredibly soft too. I'm wearing the cream towel which is 90x180cm and is 500GSM Egyptian cotton. If you'd like to see someone looking much better than I, in a much prettier bathroom, head to Em's post on Terrible Tumbles where you will find her looking beautiful, as per usual. 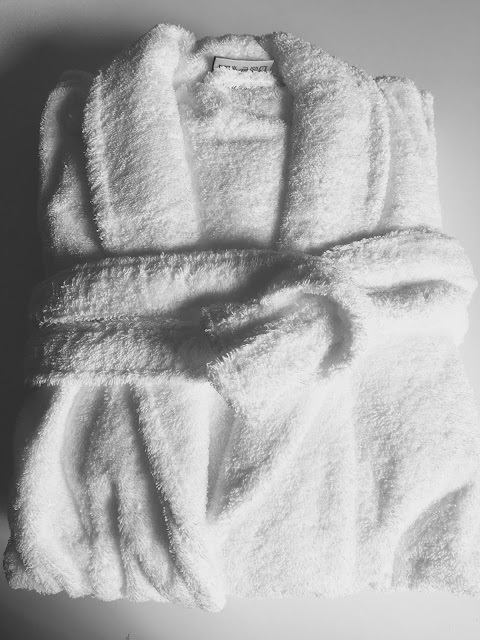 The novelty of having a towel that fits round me is quite lovely, in fact very lovely indeed. I worried that blogging about a towel would be incredibly uncool, but you know what? I don't care, because being able to bring things like this to my fellow fats means a lot to me! It makes me think about all those little things in life that our thinner sisters might not think about, like sitting in a chair with arms on it, seat belts fitting round us, finding work out clothes, or any specialist clothing like walking jackets, skiing gear... because of course, we all sit on our fat arses all day... Hmmmm anyway. I'd love to hear about any fatty barriers that annoy you and maybe I can try and find some solutions? I'm sick of using two towels! My bathroom is downstairs at the front of the house so after a shower I have to make sure I'm towelled up as I trot through the living room, past my teenaged sons watching TV! I'll be making a purchase shortly! One towel ordered, delivered and tested! Love it! Further orders to follow!